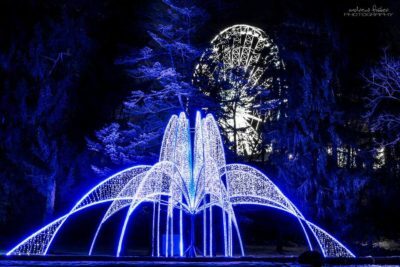 A signature WFOL display, with shimmering white lights and blue, LED lighting. The Zimmerman Fountain is located in Queen Victoria Park where Falls Avenue intersects with the Niagara Parkway. The fountain that this display sits on was built in 1856 is one of the only remaining structures from the estate of Samuel Zimmerman.